Ida Pennington could no longer speak, but the walls of her tidy Vacaville home did the talking for her. They told stories about a life well-lived and a family well-loved. A handmade family tree in the living room depicted the fruit on the branches—children and spouses, grandchildren and great-grandchildren. 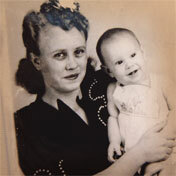 A portion of her dining room held dozens of framed photographs. 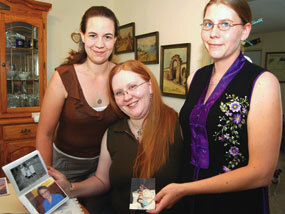 Many featured Ida’s youngest grandchildren: Rebecca, Jessica and Angela. Thanks to NorthBay Hospice & Bereavement’s Dream of a Lifetime program, the three young women were flown home to be with Ida one last time in June, just days before she died. Jessica from Texas agreed. “It never would have happened for me if NorthBay hadn’t helped.” The youngest of the girls, Angela (also from Texas), wiped away tears and nodded. She too, could not have made the trip without help. Ida Pennington was born in Oklahoma in 1926 and is remembered as an energetic woman with many talents and an appetite for adventure. Married at 16 to her childhood sweetheart, Omer, Ida traveled the world as a military wife, living in Puerto Rico, Germany, Panama and Turkey. They had three children, Gene, Patricia and Don. Together after not seeing each other for a few years, Ida’s granddaughters laughed and cried as they poured over her family albums. They pointed out pictures of their grandmother and of themselves as children and recalled fun road trips, panning for gold and eating at McDonald’s whenever they asked. Ida Pennington’s granddaughters Jessica, Rebecca and Angela Pennington, were thrilled to visit with her one last time in May. Diagnosed with multiple brain tumors in March, Ida spent a short time in a convalescent hospital. She was later brought back home where Patricia and NorthBay’s Hospice team could care for her. NorthBay Hospice & Bereavement provides support to patients and families dealing with end-of-life and quality-of-life issues for the terminally ill. With a network that provides knowledge and resources for loved ones at home, Hospice has an array of services that combine physical, emotional and spiritual care. Since Dream of a Lifetime began this spring, several families have benefited from its service.